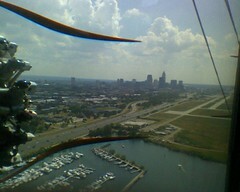 Cleveland, low and slow from the air via the Ford Tri-motor. What a beautiful flight. Raising money for the International Women’s Air and Space Museum at Burke Lakefront Airport. This entry was posted in Uncategorized and tagged EAA, Ford Tri-motor, International Women's Air and Space Museum, pilot, Rand Siegfried, Tin Goose. Bookmark the permalink.